Seen sometime in 1948 awaiting service at their 100th. Street and FDR Drive facility in upper Manhattan are several of the 157 early thirties Mack Model 6-CL-3S's shared by the East Side and commonly owned Comprehensive Omnibus Corporations. The versatile and rugged Mack Model 'CL' was in answer to the very successful Twin Coach 'streetcar' line introduced in 1929 but fell far short of Twin in sales. East Side, in business from 1931, principally served First Avenue as the M-13 between 125th. Street and Whitehall Street downtown and Second Avenue as the M-15 between 129th. Street and Worth Street and Broadway also downtown. Comprehensive, established only two years later, took over several lucrative crosstown routes including the M-1, M-3, M-4 and M-12 that had been operated by Green Bus Lines on yearly permits. The good fortunes of the two companies turned sour after the war and ended with takeover by the then City of New York Board of Transportation in 1948 - probably very shortly after the attachment was taken - and was the first foray for the municipality into bus operations in Manhattan. Photo # 3501 Courtesy of 'bk.sales' and is up for auction on eBay as item # 390520685427. Wonder if those still surviving would know where on East 108th Street was the other East Side / Comprehensive depot which the BoT also took over in '48 (and both were abandoned by the TA after 1962 when they switched all rolling stock in the TA's Manhattan Bus Division to what had been the "Central Bronx" depot of ex-STS at 126th Street and Second Avenue, rebranded the Manhattan depot [MAN]). The destination sign route "10 BROADWAY" is one of Fifth Avenue's more unusual and less known routes. It was actually a short turn, through-routed tripper of Rts. 3 & 4. It ran from W.135 St. & Broadway (near the W. 132 St Garage), along Broadway to W. 165 St., and then followed the Rt. 3 St. Nicholas route to W. 193 St. in Fort George. 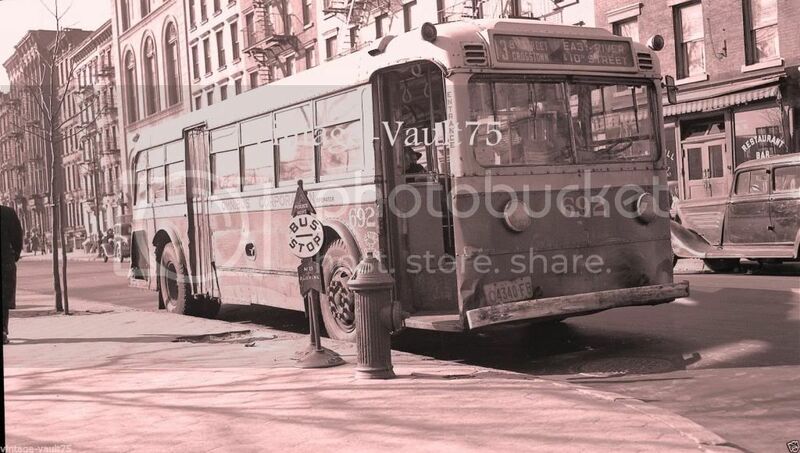 It ran into MABSTOA years because I saw 8000-series winged fishbowls with the "10 Broadway" route sign. I don't know when it was discontinued. Also, I believe bus 1212 was built by Yellow Coach in 1934. 10 Broadway lasted well into the MaBSTOA era all right, for it to have been listed on side signs of 'batwinged Fishbowls'; c.1973 side rollsigns made for T6H-5309A's listed 'M10 Broadway' right below (ex-NYCO Division) 'M10 8 Av-Cent Pk W'. Had this pull-in, pull-out route survived the 1974 renumbering, what would it have been renumbered as? I suppose a 1974 side sign made for the new Flxible 53102-6-1's would have provided the answer, were it to turn up? The time is 1940 and the place is Manhattan's East 10th. Street and Avenue B where we see a tattered fleet # 692 - a 1936 32 passenger Yellow Coach Model 728 and one of nearly 300 likenesses purchased in increments between 1935 and 1936 by the Chicago based Omnibus Corporation affiliate New York City Omnibus Corporation (NYCO). 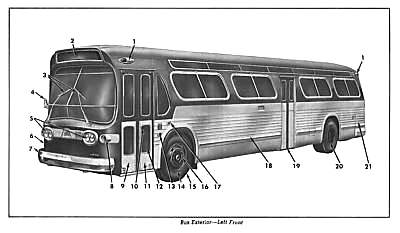 In size, the 728 was the smallest capacity coach in the Omnibus stable which included the 36 passenger model 731 and the 41 passenger model 718 and found its niche as a crosstown feeder and on lighter traveled routes. Mechanically, the 728 was gasoline powered by a transverse mounted plant at the rear and was originally equipped with an air clutch for a smoother more jolt free ride but proved to difficult to maintain and was eventually replaced by a standard transmission. # 692 is seen heading eastward on the #13 Crosstown line from West Street at the Hudson River to the East River at 10th. Street via 8th. Street with its return to the west side on 9th. Street. Of note is clear shot of one of the thousands of Bus Stop signs used by the city for nearly three decades. Photo courtesy of 'Vintage-Vault75' and is available at eBay as item # 181311642515. 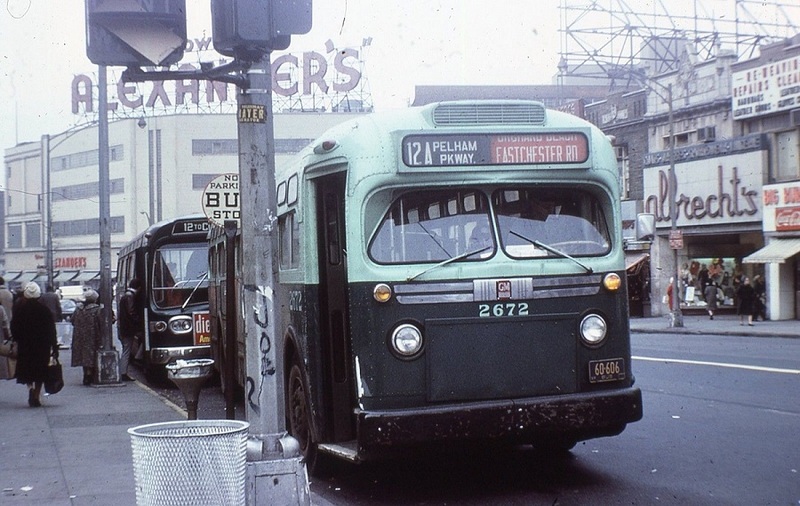 This route, along with 12 - Spring & Delancey Streets and 14 - 14th Street Crosstown, was based out of 12th Street depot which for years had among the oldest buses in the fleet as they stood at the time. Rebuilt Yellow 740's were at that garage (which could only house 60 or so buses, and a few others had to stand out in the street when not in use) well into the Fifth Avenue Coach Lines era; by December 1965 80 buses from the 1949 order of TDH-4509's (numbered 2737-2816) were stationed there, and in its last years up to its 1972 closure upon the opening of the much roomier Hudson depot the last 68 of the first made-for-MaBSTOA order of 1963 TDH-5303's (3488-3555) were based out of 12th Street. (Those buses, plus 3482-3487 of that order formerly based at 100th Street, were part of the initial set of buses that went to Hudson when that garage first opened.) I wonder if those who are still with us on this forum, remember what farebox code was used by 12th Street (in the vein of FFS = 54th Street; OFS = 132nd Street; OTS = 100th Street; OFS = 146th Street and AMS = Amsterdam, plus MAN = Manhattan of the TA). 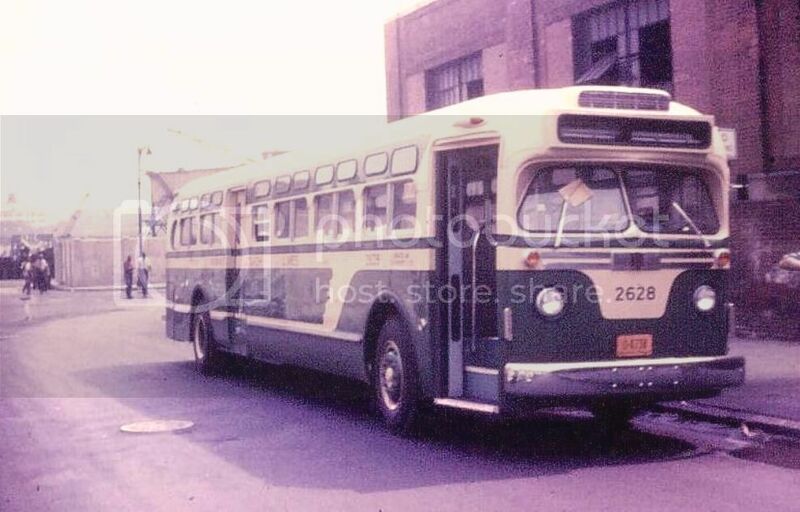 Seen shortly after arrival from the factory and being readied for service at a company facility in Manhattan is fleet #2628 - a 1958 45 passenger GM Coach modeled as a TDH-5106 and one of ninety likenesses numbered from 2605 and 2694 purchased in increments between 1958 and 1959 by Fifth Avenue Coach Lines, Inc.
# 2628 is so new that it has yet to receive either its first New York State Public Service Commission inspection sticker or its main destination scrolls as can be seen missing in a specially built cabinet above the windshield designed for fluorescent back lighting. 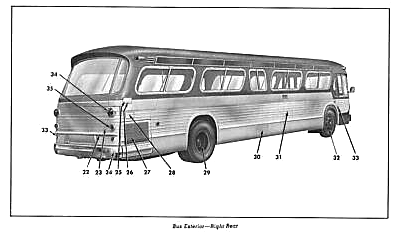 While #2628 and its ilk were built as a 51 passenger buses they are configured for only 45 due to a salon style U shaped seating plane aft of the rear doors. This order along with forty almost exact duplicates purchased for commonly owned Surface Transit, Inc. were the last Old Looks for the company. It's always so refreshing to see a brand new bus before it's maiden voyage especially through the rough and tumble streets of the Big Apple! Photo 'borrowed' for educational purposes only. Looks like that facility could be the 146th Street garage (now the Mother Hale depot). 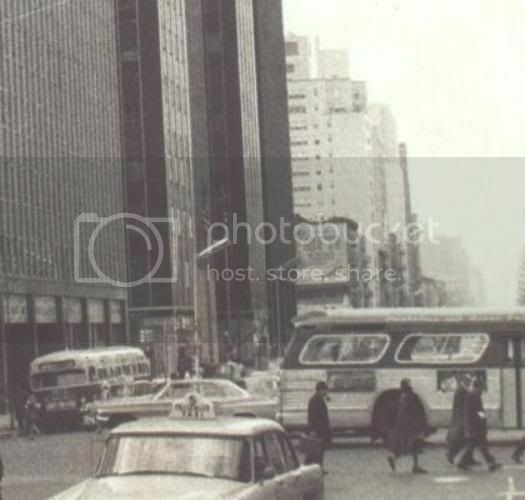 Buses of that numbering range were seen on the soon-to-be-defunct 4 - Lexington & Lenox Avenues line in one photo "out there" taken around 1959. And to think 2966 from that same order made a cameo in Butterfield 8 alongside Elizabeth Taylor. This actual 2969 doubtless would have been retired and then scrapped upon the arrival of the A/C batwings in early 1967. Had that pic been taken a year later that bus would have been flagged as Fifth Avenue Coach Lines Inc.
Fifth Avenue carries one-way traffic downtown (southbound) from 135th Street to Washington Square Park, with the changeover from two-way traffic taking place on January 14, 1966, at which time Madison Avenue was changed to one way uptown (northbound). Two-way traffic on Fifth Avenue is allowed north of 135th Street only. From 124th Street to 120th Street, Fifth Avenue is cut off by Marcus Garvey Park, with southbound traffic diverted around the park via Mount Morris Park West. Actually, when Fifth Avenue became one-way southbound, it was initially from 138th Street to Washington Square Park. Can anyone still on here advise when the southbound-only pattern was truncated to 135th? Eastside Omnibus rented a depot at East 92nd Street between York and First Avenue; Comprehensive had a depot and lot on East 100th Street closed to the river. After City take over the depot on 92nd street was vacated and moved to 108th Street city garage and lot. In 1951 the City acquired a storage lot at 128th Street and Second Avenue an ex-Second Avenue El yard. According to Motor Coach Age, May 1972, route 13 was operating out of the 54th Street Depot. requiring 10 buses during the morning hours and 7 in the evenings with only 3 on Sundays. The 12th Street Depot housed routes 12 and 14A and 14D. 68 buses were assigned to the depot, TDH-5303s numbers 3488-3555. Ex-Fifth Avenue Coach, 2672, in the Bronx on route 12A Pelhalm Parkway. 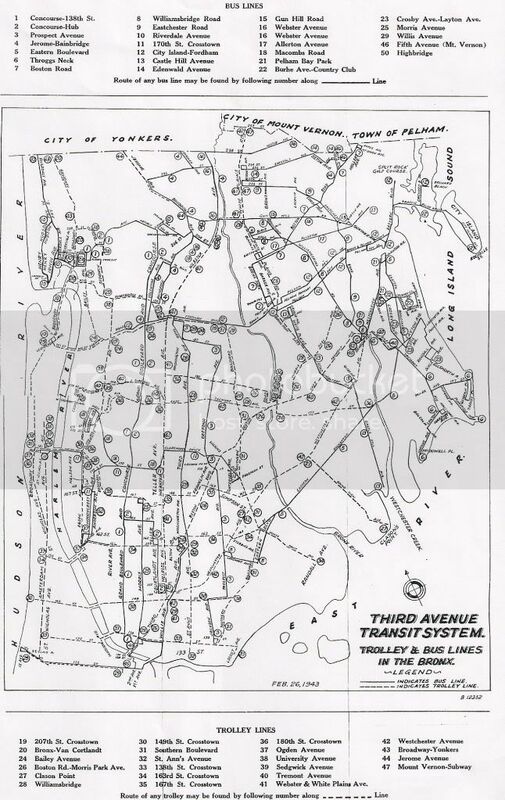 I'm curious, would that 1969 Motor Coach Age article on the TA's bus operations mention at what point the M-13 First Avenue and M-15 Second Avenue were combined into the M-15 First and Second Avenues line? I ask because of this 1953 transfer of M-3 49th and 50th Streets, little over a month before the TA took over all BoT operations . . .
And in a related matter, at what point would M-13 have been reconstituted as the Journal Building shuttle bus (I presume around 1958?). I know either due to inertia or cheapness on the part of the BoT and TA, prior to the arrival of the 7000 series of TDH-5106's in 1957, northbound buses on First indicated 'M13 First Avenue' and southbound buses on Second, 'M15 Second Avenue', before the later buses that showed 'M15 First & Second Avenues'. 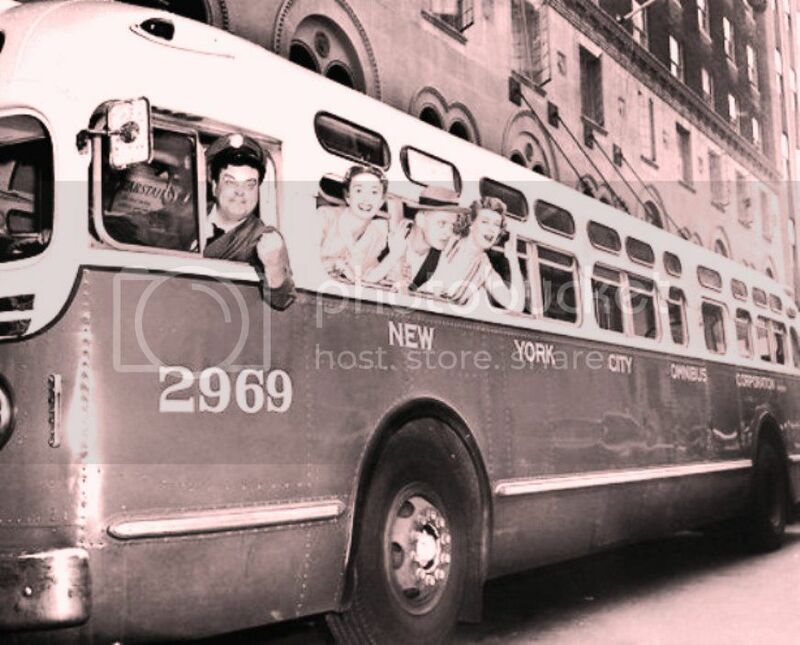 Going way back, I presume it was before the onset of WWII that the M-12 York Avenue/86th Street and M-14 Astor Place shuttle of East Side Omnibus would've fallen by the wayside . . . ? P.S. There was also to be a Bx-48 - New Rochelle-Subway line; that route, when bustituted, became WST and/or WER (Westchester Electric Railroad) Route A. 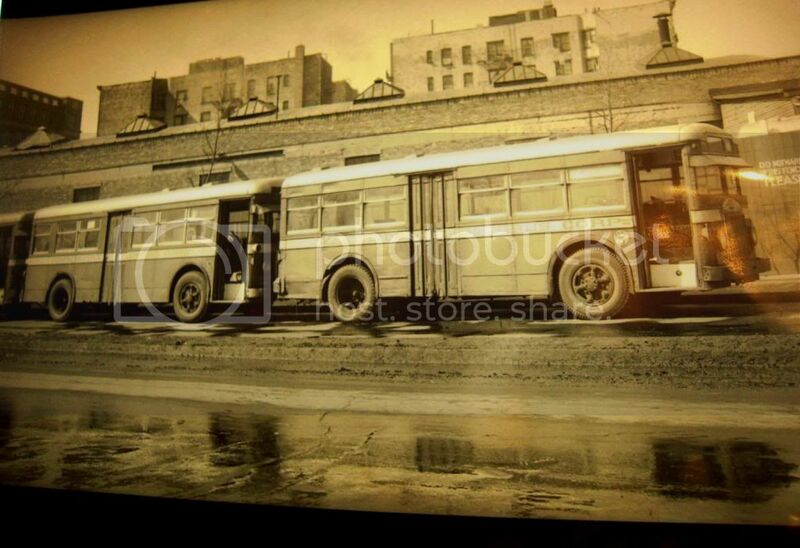 As well, had a Manhattan route map been published by TATS at the time, there would have been exactly one bus route in that borough run by STS: M-107 - Haven Avenue, which despite its description was actually a 180th-181st Street crosstown shuttle bus running east on 180th and west on 181st between St. Nicholas and Haven Avenues, service inaugurated June 24, 1941. It was the only STS route in Manhattan to have been started from scratch and not derived from an earlier streetcar route - which, as I suspect, would have been referred to in such a map by the numbers they would later display after being converted to bus service (i.e. 100 Broadway-Kingsbridge, 101 3rd Ave.-Amsterdam Ave.). This first M-107, for a variety of reasons (namely war-related), ended up very short-lived, reduced to once-a-day service after June 7, 1942, and eliminated for good on May 30, 1943. I did see the movie and it was no thriller! Mr. Borgnine, who is still very much alive at the age of 95 and who was a good deal thinner than in his later 'McHale's Navy' days, is not smoking a cigar in the photo - it's a reflection of the lighting cast across the railing behind the driver's seat - it looked like a cigar to me as well. The sister to 1563 that made the papers in the Florida caper was 1310 as seen below in a right hand drive version (it's what a GM Old Look would have appeared like in Australia!). 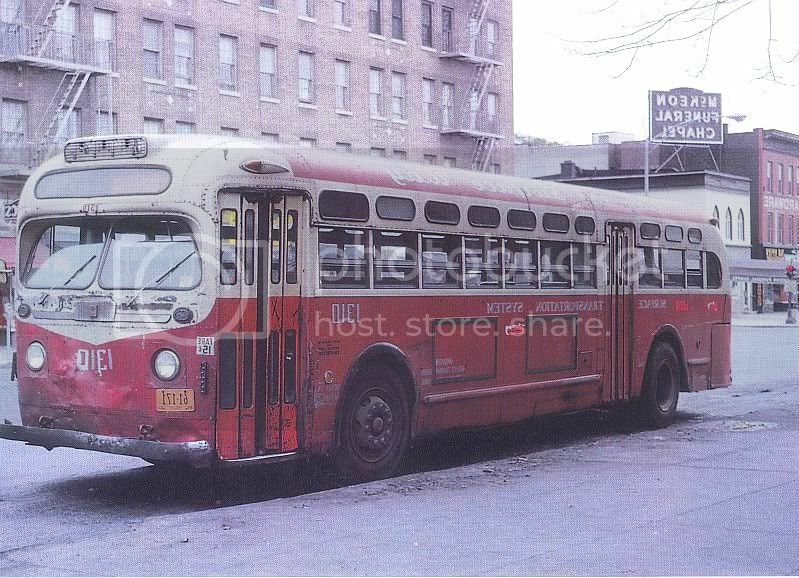 The 5303 bus was part of that first group (3301-3555) assigned initially out of three ex-STS depots (one of which being Amsterdam, as evidenced by its traveling around 42nd Street, very likely on M-104 as M-106 by then was assigned out of 54th Street depot) and the ex-FACCo garage at 132nd Street. I can only surmise on the Mack - which would have been based out of Amsterdam, as well - that the M-101 Third, Lexington and Amsterdam Avenues line was still "split" at that point between Amsterdam and 100th Street (much like Q32 today between Quill and Stengel, and M11 between Quill and Manhattanville); not until after 1965 would M-101 be assigned out of 100th Street exclusively.